The Best Western Plus Windsor Hotel is a beautifully restored historic destination hotel, originally built in 1892 and recently renovated in 2010. 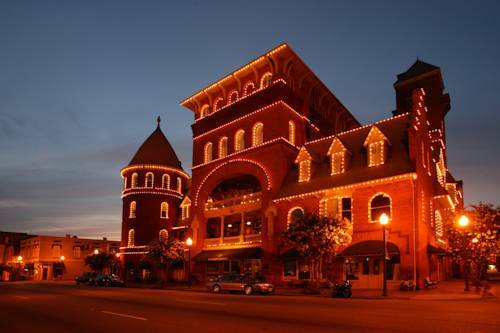 Guests staying at this historic Americus hotel can engulf themselves in rich local history ranging from President and Mrs. Carter's first stay in the hotel in 2002 to the National Cemetery and National Prisoner of War Museum dating back to the Civil War. The hotel's convenient downtown location is close to other popular attractions including the Rylander Theatre, the Koinonia Farms and the Jimmy Carter NHS. Corporate travelers staying at this Southwestern Georgia hotel will be minutes from the Habitat for Humanity� National Headquarters, the Phoebe Sumter Medical Center and the Fuller Center for Housing. Favorite local events include the Hodges Hobbies Flight Festival, the Plains Peanut Festival, historic ghost tours, and the SAM Shortline Railroad event. Experience the luxurious surroundings, beautiful architecture and impeccable service at this destination hotel - minutes from Georgia Southwestern State University and the Andersonville NHS. This Americus Georgia destination hotel proudly offers a variety of luxurious room types thoughtfully-appointed to accommodate both business and leisure travelers. Each guest room is complete with granite countertops, a microwave and refrigerator, duvets, flat screen televisions with cable satellite HBO� and high-speed Internet access. This hotel in Americus features a delicious breakfast available at Rosemary & Thyme Restaurant each morning. Additional amenities at this charming inn include Floyd's Pub, a fitness center, business services and spacious meeting facilities-perfect for any event including destination weddings, family reunions and corporate conferences. Enjoy a step back into an elegant history of the South at the Best Western Plus Windsor Hotel! Enjoy your stay. 1.30 mile(s) from Hillside Grill, full service, American, open for: breakfast, lunch, offers a great hot breakfast, a famous lunch buffet, and a dinner menu to please anyone in your group. 0.10 mile(s) from The Kinnebrew Co.
0.10 mile(s) from downtown shops, Best Western Plus Windsor Hotel is walking distance to all downtown shops. One featured exhibit is the blood-stained collar of Miles Cribb, displayed next to the hook on which he was hanged in 1914.